We have a long history of providing both industrial and consumer construction projects with architectural, OSHA, vinyl, safety, and ADA compliant signage. Our capabilities do include Braille. So whether you require beautiful directional or informational signage found in office buildings and hotels, or functional safety signs, we have got you covered! Showcasing the most frequently purchased products by leaders in the Construction Industry. To adhere to the American Disabilities act is to comply with more than just Braille. There are many rules regulating ADA signage, so let us help you create compliant signage. We have the capabilities to produce Braille signage in addition to the other general rules, such as having a non-glare background and easy to read type faces. Advanced Graphic Engraving has laser etched many customer furnished stainless steel doors and enclosures to customer specification. 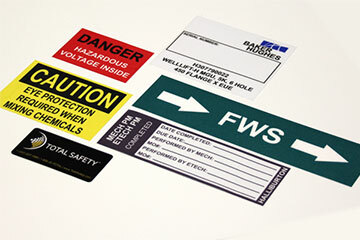 AGE produced safety signs and engraved plastic tags for the construction of an offshore lift boat. Advanced Graphic Engraving manufactured approximately 8,000 wire markers for an explosion plant being built by Dyno Noble. Advanced Graphic Engraving provided safety signs for the construciton of two land drilling rigs. Here is what our Construction customers have to say about our work.